All her life, Spensa has been branded a coward’s daughter. Her father was a space-fighter, and in a critical moment, fled from battle and was shot down by his own team. Spensa is determined to prove that she’s not a coward, and if possible, to clear her father’s name in the process. The high commanders don’t want her anywhere near a spaceship, claiming that she will inevitably follow in her father’s footsteps. But Spensa resists, and pushes, and gets far more than she bargained for. I don’t generally like science fiction. I prefer Sanderson’s adult fiction to his younger stuff. I prefer Sanderson’s Cosmere-based works rather than ones not set in the Cosmere. I listened to a video of Sanderson reading the first chapter aloud a year ago, and I didn’t like that chapter at all. Once again, though, Sanderson pulled off the impossible and made me love a book that had all the above going against it. If it were any other author, I never would have bothered to read past that first disliked chapter. But Sanderson, y’all. The man is brilliant. And this book was awesome fun. True, I didn’t like it as much as I do his adult or Cosmere novels. But in a time when most books don’t hold my attention for a second, the fact that this one kept me speeding through it says something. I really enjoyed the story. 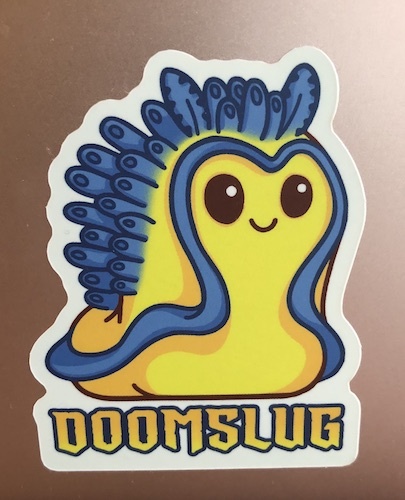 I loved the sentient spaceship and the slug that can imitate human voices with vibrations (Doomslug!!). I loved Spensa’s fellow cadets in flight school, and was sad whenever I had to watch Bad Things happen to them. I even eventually came to love Spensa, after she grew up quite a bit (she annoyed the hell out of me in the beginning). There was really only one thing that bothered me (other than early Spensa), and I can’t really discuss it without going into spoilers. (Has to do with Spensa’s dad.) It’s something I’d expect from a YA novel, though. Just wished it could have been a bit deeper/more realistic. 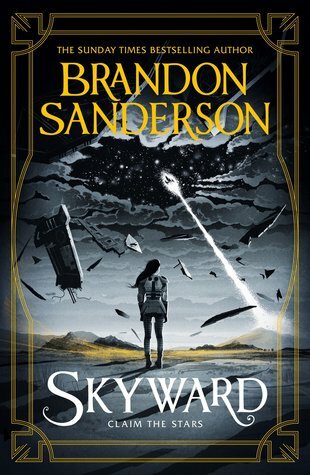 Speaking of depth, though: While Skyward didn’t have the layers that you find in adult Sanderson novels, there was still a lot stuffed in here – what it means to be brave and/or a coward; life living in a parent’s shadow; class stratification; authoritarianism; the culture of violence so prevalent in humans; etc. But honestly, it was also just a really fun, well-paced, suspenseful action book with funny (human and non-human) characters and a lot of heart. I highly anticipate the next volume! This entry was posted in 2018, Prose, Young Adult and tagged dream-invader, speculative. Bookmark the permalink.